Yale at Syracuse is one of the most anticipated games of the opening weekend. Which of Sunday’s #NCAALax Championship matchups are you most looking forward to watching on @ESPNU? So we would be remiss to not create a Yale vs Syracuse Preview. Syracuse, the #2 seed, draws a Bulldogs team led by Ben Reeves. Game will be broadcast/streamed on ESPNU. As with several other first round matchups, there is a sentiment that Syracuse was unfortunate to draw a team as good as Yale right off the bat. 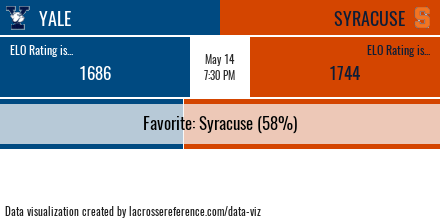 Our Lax-ELO model thinks that Syracuse is the favorite, but not a heavy favorite. Based on current Lax-ELO ratings and the home-field bonus for the Orange, the model says, they’ve got a 58% chance to advance. Syracuse comes into this game as the #6 top efficiency offense. Yale appears on the list at #12. And since both defenses are in the bottom half of Division 1, a forecast of fireworks would seem fitting, especially in the perfect dome conditions. Both teams tend to play slower than the average offense, with Syracuse averaging 41 seconds before a first shot (34th in the country). Yale is even slower, taking 44 seconds to get a first shot off (57th in the country). These are two teams that work it around, probing for opportunities. Yale’s pacing has resulted in a pretty good time of possession advantage for the Bulldogs. They have averaged 31.7 minutes of possession per game. Good for 7th in the nation. Syracuse on the other hand, has held the ball for 29.7 minutes (27th in the nation). But even though they look comparable on the surface, there are some stylistic differences that bear noting. And if you are Yale, this seems aligned with your strengths. For Syracuse, perhaps not so much. The chart below shows a comparison of the two teams’ offensive effectiveness, split up by the length of the possession. We have also included all D1 teams for comparison. We can see that Syracuse’s offense is about 10 percentage points better than the average D1 offense in possessions that last less than 40 seconds. There is a mismatch there. They are at their best in quick possessions and very long possessions (100+ seconds). And we can see this show up in the games that they’ve lost. In the chart below, note the large green bar in the 40-60 second bucket. When they’ve lost games, they’ve had lots of possessions in the time range that has not been kind to them. Keep an eye on when Syracuse is taking their first shot on possessions. If it’s coming in the first 40 seconds of the possessions, they’ll be taking advantage of their strengths. If they attack after 40 seconds, they are going to be going after some lower likelihood chances. If you are watching Yale, the opposite applies. 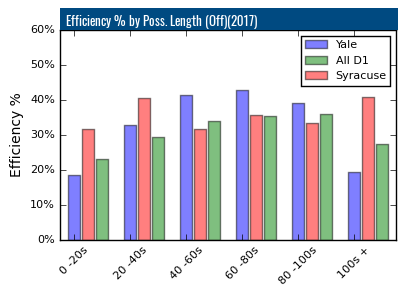 Where Syracuse may want to be more aggressive, to be in line with their offensive strengths, if you see Yale starting to take quick shots, that could be a bad sign. As we saw above, Yale is most effective in possessions that are between 40 and 80 seconds. 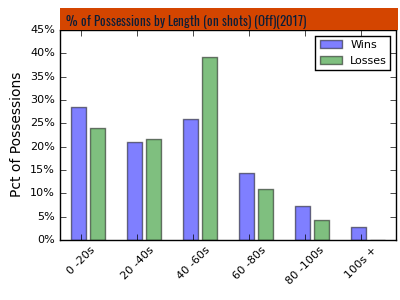 And in the chart below, we can see that in wins, roughly 50% of their possessions have a first shot between 40 and 80 seconds. Only about 38% of their possessions have a first shot quicker than 40 seconds. 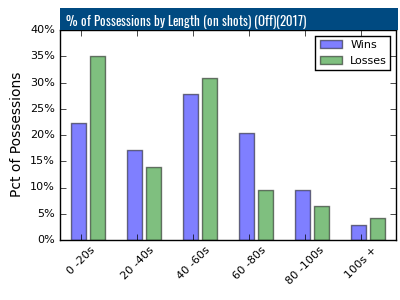 In losses, 50% the numbers are flipped, and far more possessions feature quick shots. And certainly, a team that is losing big in the 4th quarter is probably going to be taking more quick shots. But if you see Yale getting caught up in a footrace early in the game, be worried. The trends suggest that Syracuse is in a better position if the game is played at a faster pace. Both of these teams stand out in one specific offensive situation: unsettled possessions after a ground ball pickup. We split possessions into four categories, based on how the possession is gained: faceoff wins, defensive stops, ground balls, and penalties. Both of these teams are much better on possessions that start with groundballs than all other possessions. Syracuse transforms from the 6th to 3rd best offense in the country when it’s a possession that starts like this. Yale goes from #12 to #6. So both teams are at their best on possessions that start with ground balls. Ground balls tend get outsized importance because they are a great proxy for effort. But like fumbles in football, there is certainly an element of luck involved. Since both teams are great in unsettled situations, a few bounces could lead to a few extra juicy possessions. And a few extra juicy possessions could have a big impact on the outcome of this one.